All week we have been talking about the different possible tracks this weekend's storm could take. A more southern route would mean an absolute soaking for the Front Range, while a more northern route would mean more downsloping and less precipitation for western portions of eastern Colorado, or dry slotting. Last night we discussed that most of the models were coming into better agreement, and that the favored track appeared to be a more northern one. Several more model runs since then, and the same rings true today. In the following images, note where closed circulation of the upper level low is (the previous southern route is denoted by "south" in the first image). 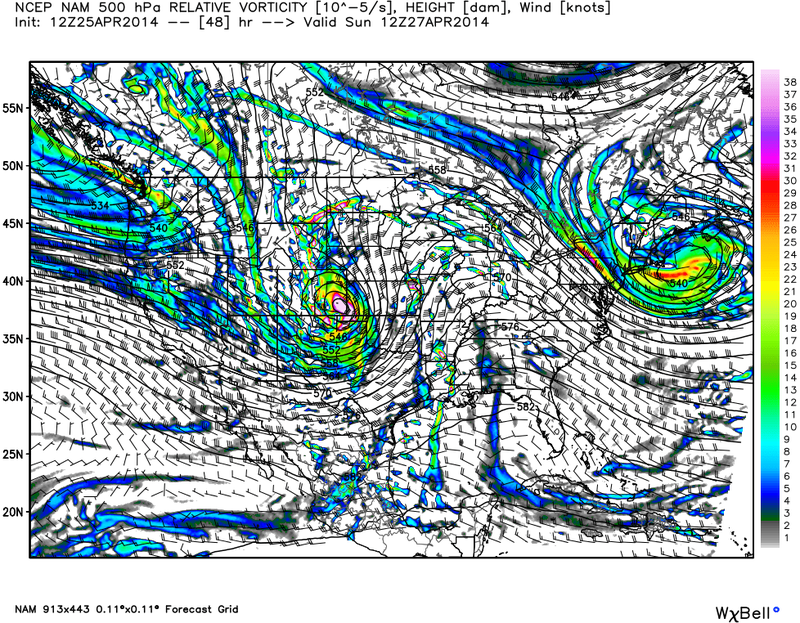 The GFS, ECMWF, and Canadian all have the center of circulation over northeast Colorado by midday Sunday. The NAM remains the outlier, digging the upper level low a few hundred miles further south than the three global models are taking it. This would mean more precipitation for a good portion of eastern Colorado, as downsloping won't be so quick to kick in on Sunday. Given what time of year it is, and after the devastating floods last year, it's actually probably not a bad thing if we dry slot along the northern Front Range with this storm. The alternative would likely mean decent flood risk, especially as rivers are starting to run higher with snowmelt underway in the high country. 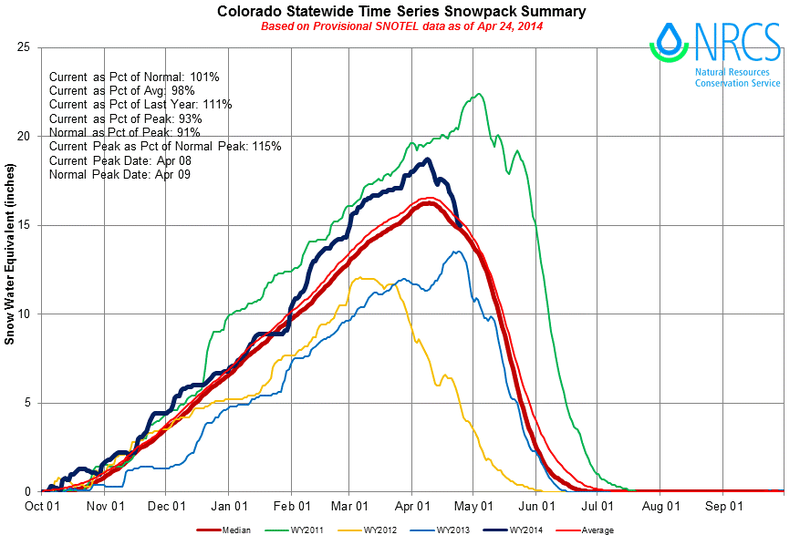 While we are expecting a big spring snow for much of the mountains, the snowpack has already started to decline in the last two weeks. Here's the latest SNOTEL snowpack summary. 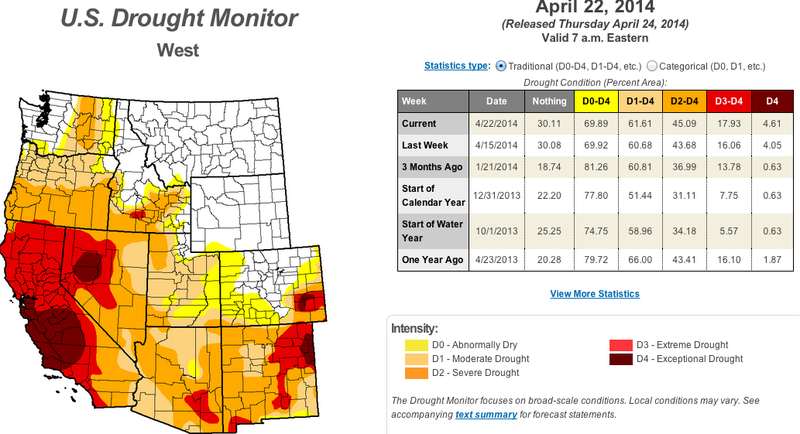 Unfortunately, none of the models are quite far enough south to bring beneficial moisture to the part of the state that needs it most -- southeast Colorado (latest drought index, bottom left). 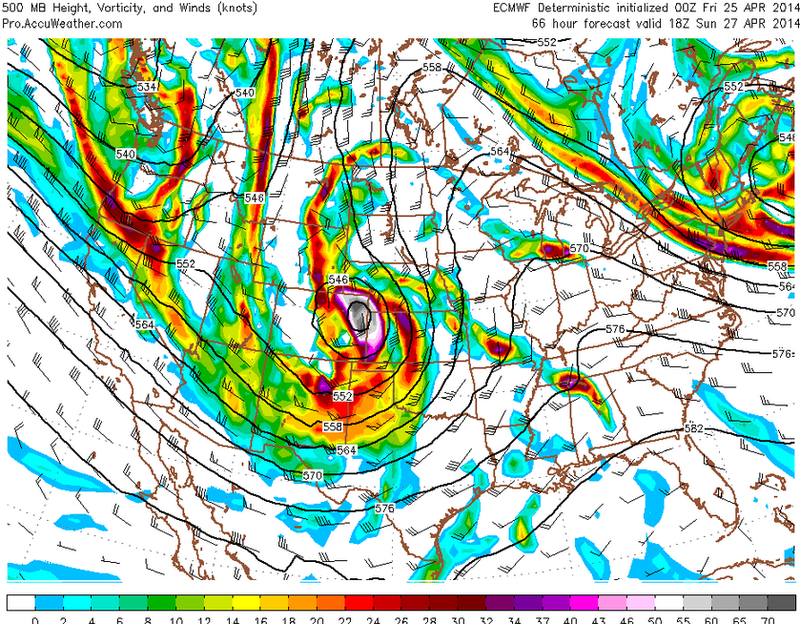 The NAM's solution will likely favor that part of the state the most -- but even it has a bigger bulls eye for the Palmer Divide and extreme northeast Colorado for precipitation (right). This will be a chilly system, but not downright cold. 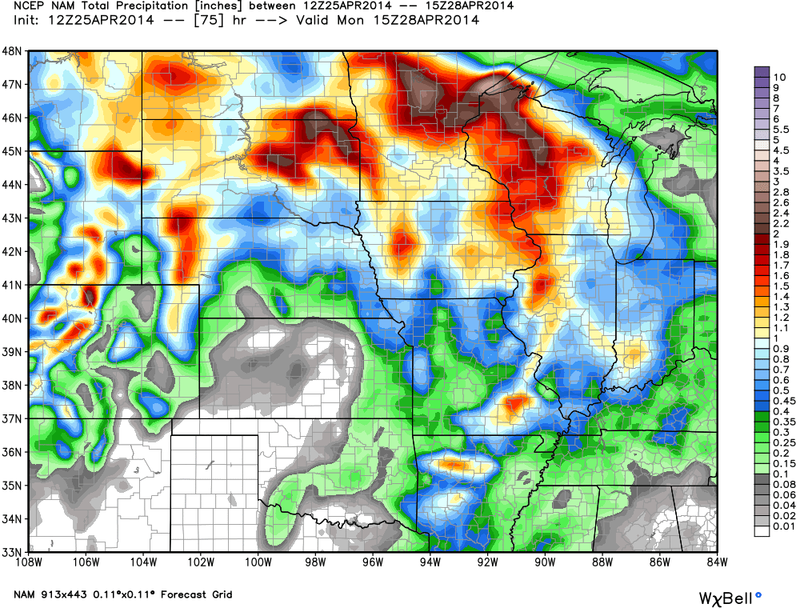 Therefore we expect most locations at lower elevations to primarily see rain through its duration. The one spot we are watching (outside of the mountains) is the Palmer Divide. We expect rain could change to snow there Saturday into Sunday, and in combination with the wind could create dangerous travel conditions. 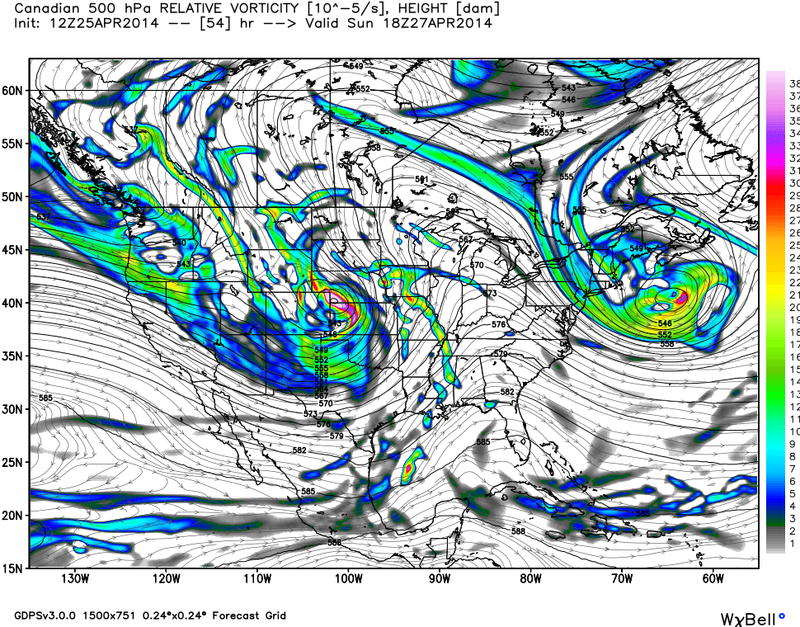 If your travel takes you north of Colorado Springs, or south of Denver Sunday -- please plan accordingly. In a nutshell, little change to our going forecast. Still expecting big changes to our weather by late in the day Saturday (we're already seeing the clouds today on the leading edge of this storm), and still looking at a cool and damp pattern setting up for Saturday night possibly well into next week. This is a slow moving system, so get out and enjoy the warm temperatures today, as it looks like a patch of several days in the 50s are on the way. 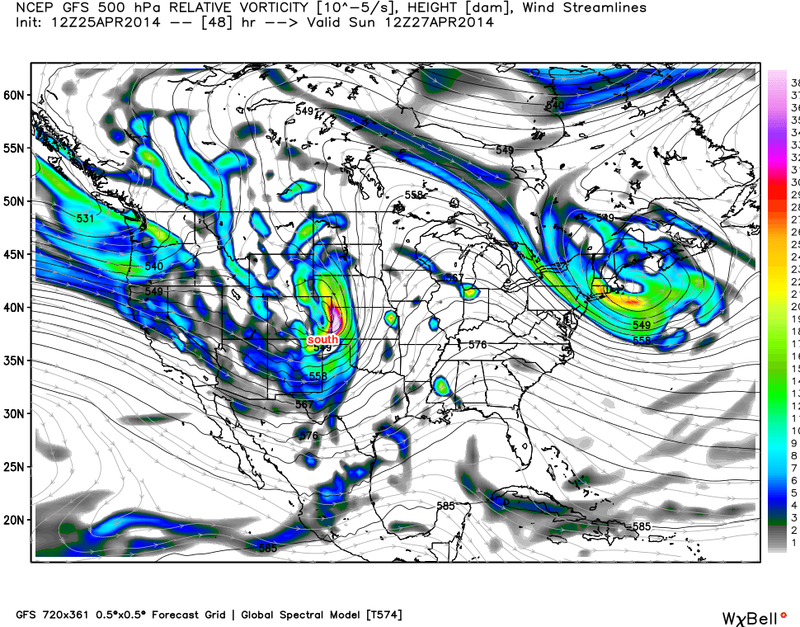 Again, eventual track of this storm will be the deciding factor in who gets more or less rain and snow and when. There's good agreement now, but still a few potential wrenches to be thrown that could mean an adjustment to the going forecast. Make sure you're subscribed to Weather5280, and keep up to date with any changes that may come over the next 12 to 36 hours.